Halcyon Future: New Goodies: Shopping Haul! So I thought I'd share with you a few of my most recent purchases. Firstly because i'm in love with quite a few of them and secondly, because being currently unemployed my shopping habits may have to be significantly curbed for a (hopefully!) short while. I literally bought these yesterday and I'm already in love with them and planning our wedding. Alright, maybe a slight exaggeration but I'm very much looking forward to wearing them. The next week still looks to remain above 30 degrees, so it may be a little while before I can take them out for a spin. I've seen the herringbone pattern a lot in the shops recently, and I think we're going to see a lot more of it in the coming colder months. I personally love it - I think most of the time it's a very classy pattern, and I love the chic-ness of it in the monochrome tones. These ones are very skinny, stopping just above the ankle - a length I think works well with a lot of shoes. The sides have a solid black strip which breaks up the block of pattern. I'll wear them for both casual and dressy events - during the day with a simple black top/shirt and boots and for the evening pair them with some mega high heels. I'll probably keep my top half simple and play about with some bright accessories. They were $49, which I think is an alright amount for a good pair of trousers - hopefully I'll get a lot of wear out of them! If the trousers are my new love, then these are definitely my babies. I got these the other week from Wittner (basically where I get all my shoes) for a whopping HALF PRICE! Mind you, they were still a decent chunk of my pay check, but as soon as I saw them, I'd made up my mind I had to have them. I've actually already worn them (for my boyfriend and I's 2 and a half year anniversary) and they're surprisingly comfy. Apart from the fact that I feel like Cinderella when I slip my feet into them, I love the elegance of the slightly lower heel and delicate ankle strap. It's a much welcome change from the mad high stilettos and chunkier heels that have dominated the past few seasons. 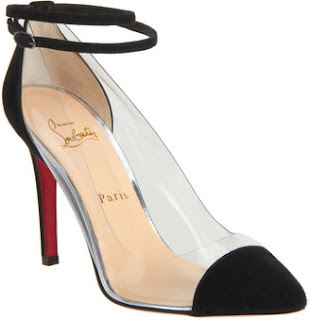 Thinking about it, they remind me a bit of these Louboutin ones... what do you think!? Now the whole Diva/Lovisa thing kind of confuses me but who is to argue with a 3 for 2 offer!? I've been into a Lovisa a number of times, admired their wares but never actually bought anything. I tend to buy a lot of clothes and bags, but rarely accessories which is really starting to show in my wardrobe. Accessories are a fantastic way to cheaply update your wardrobe, so I thought i'd stock up while they had some good deals on. Because the weather has been so amazing lately (hello lazy days by the pool in 30 degree heat! ), most mornings when I have woken up to get dressed I've felt very summery - which would explain why I was immediately drawn towards the bright lights of the neon! Now I don't normally wear dangly earrings because they tend to get tangled up in my hair, but I really liked the design of these ones, and think there's something kind of more 'grown-up' and 'fashionable' about long ones - (probably stemming from when I used to watch my mum get ready when I was younger - she had an enviable collection!). I didn't actually plan for all the items to match - purely coincidence, I promise! The style of the necklace has been around for a long time and in a multitude of colours. I couldn't decide on one, so I chose the one that combined the lot! I was drawn to the neon enamel bangles - I think they're very vaguely reminiscent of the gorgeous Hermes ones (only the fact that they're bracelets and enamel really) but thought they'd brighten up a few outfit. The whole lot came to about $14 which I was pretty impressed about! This is a bit of a cheat one really, as technically I get British Vogue through a subscription (Thanks Grandma, Aunt and Cousins!). If you don't know, I'm originally from London and have lived in Australia for the past five years, and my Vogues are kind of my link back home and a way of keeping in touch with the trends. This is an especially good issue, hence the inclusion! I did actually buy Yen, it's one of my favourite Australian magazines - it's always stuffed full of things a little off beat but always very interesting. I'm not going to lie - I picked up this issue mostly because of Lena Dunham on the cover - am currently OBSESSED with Girls (if you haven't watched it, DO SO NOW!). I think it's so impressive how much she's achieved and she's only in her twenties! There's also a great article/interview/profile piece on Grace Coddington, one of my favourite people ever. If you've seen 'The September Issue' or regularly read US Vogue you'll probably be familiar with her. That's really only a selection of the things I've bought recently - let me know if you enjoyed the post/would like to see more/never want to see it again or if you've snapped up some great bargains/purchases recently!